The Chickens are Coming! The Chickens are Coming! Imagine waking up to find a giant, mechanical, robot chicken pecking into your window. Imagine that your parents and many of your loved ones have disappeared because these giant robot chickens have somehow landed in your town, Aberdeen, Scotland, and are running amok chomping up everything in their mad path. Imagine this, and you have Jesse, Sam, Noah, Rayna, Lizzie, the Library Gang, and a few other young survivors on a quest to destroy this fowl plague that has attacked not only your town, but other places around the world as well. 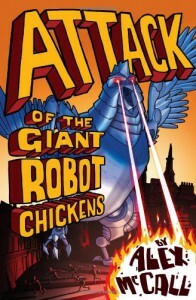 And that is Attack of the Giant Robot Chickens by Alex McCall. Prepare to embark on a journey both serious and ludicrous as this intrepid band - with one adult who thinks he can figure out how to diswing (disarm) these vicious dumb clucks - take on a foe that is larger than life. Better than zombies, better than aliens, better than a poison gas miasma that wipes out everything in their wake, these chickens pose a corny threat to every living thing. In fact, they have managed to co-opt some children into the Brotherhood of the Egg and dressed them in chicken costumes to do their bidding. Can Jesse and his pals vanquish the giant robot chickens and bring order back to their part of the world and the world at large? Well, of course. 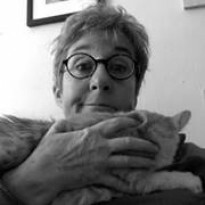 HOW they do it is what makes this book, and you have to read it for yourself, because no review could do justice to the story that Alex McCall tells in this tail. This book is for middle-schoolers, but this adult who loves a good chicken joke was rolling on the floor of her coop clucking her sides in hysterics. Read it and cheep. WARNING: Contains bad puns, chicken jokes, and fowl language. And, there are no spelling errors in this review.